Takeaway Lanzarote - Restaurants Puerto del Carmen Cooked with onions, ginger, garlic and simmered in an aromatic spices. 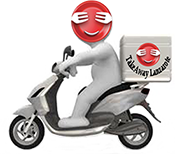 Takeaway Lanzarote - Restaurants Puerto del Carmen Cooked with rich cream sauce made with tomato, onion, cashew nut. Takeaway Lanzarote - Restaurants Puerto del Carmen Cooked with coconut, crushed cashews, raisins and rich creamy sauce.